Visit Snow Peak's Titanium Trek Combo page. 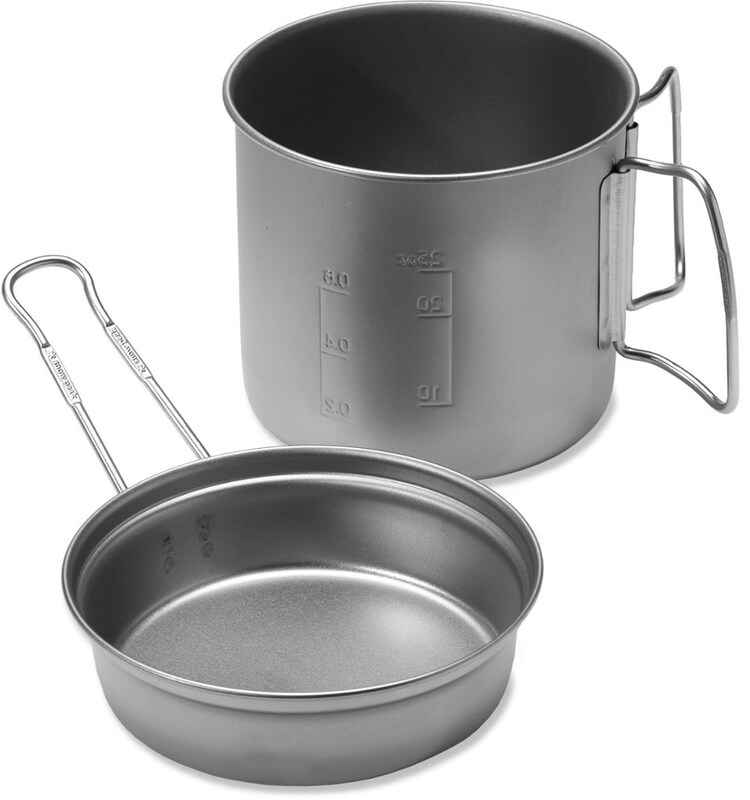 Snow Peak Camp & Hike Trek Combo Titanium Cookset SCS010T. 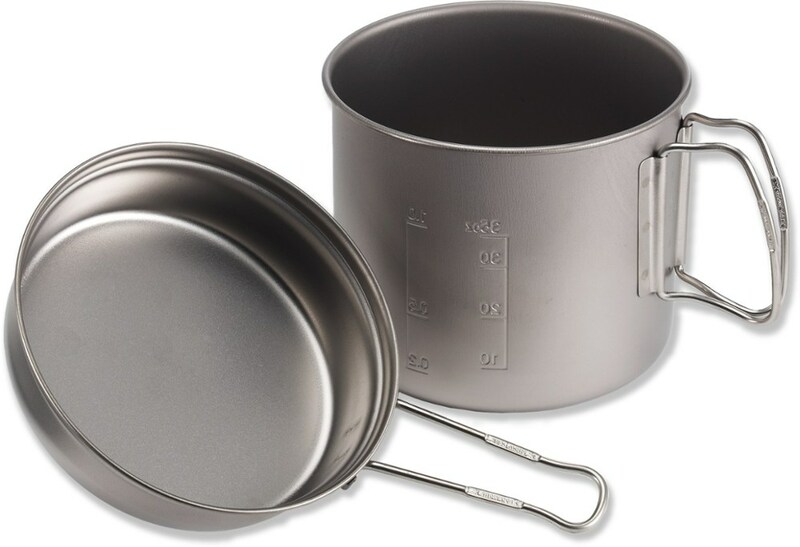 This set comes with a smaller pot which can contain 30 oz and a larger pot which can contain 47 oz Both pots and lids come with folding handles which make for stack ability and transportation. The Snow Peak Trek Combo combines the 2 most popular sizes of Snow Peak pots into one money saving combination. Buy the Trek 900 and Trek 1400 together and save. 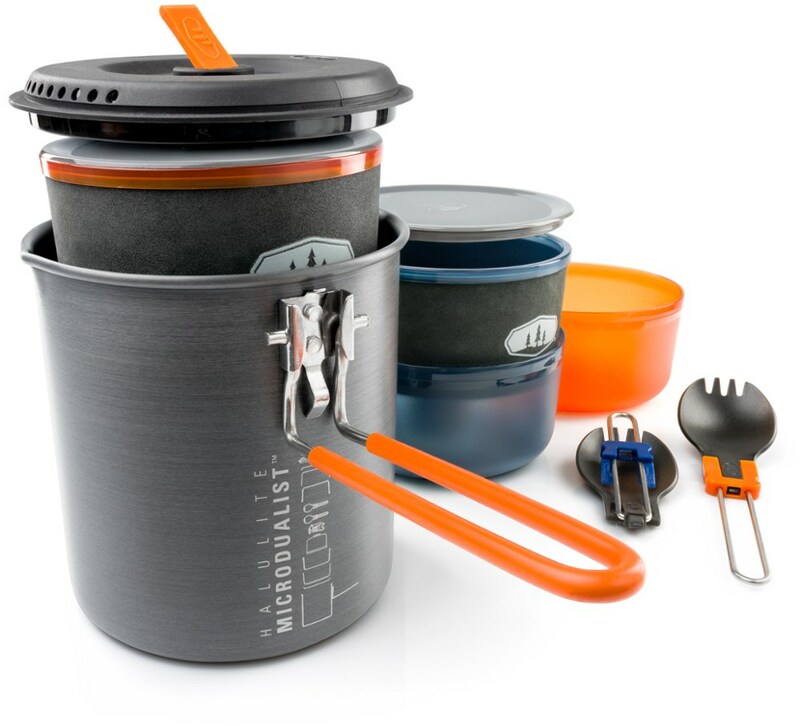 The pots nest together so you don't have to take up any extra room in your pack. 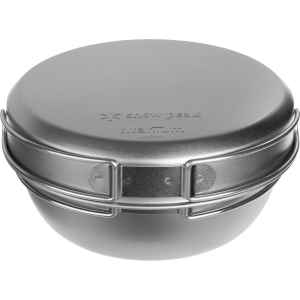 The lids also nest and work as small pans, lids, or even plates. 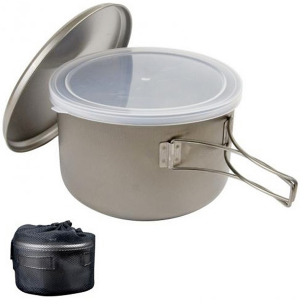 Snow Peak makes some of the best camp cookware and this backpacking cookware is a light-weight backpacker's favorite. 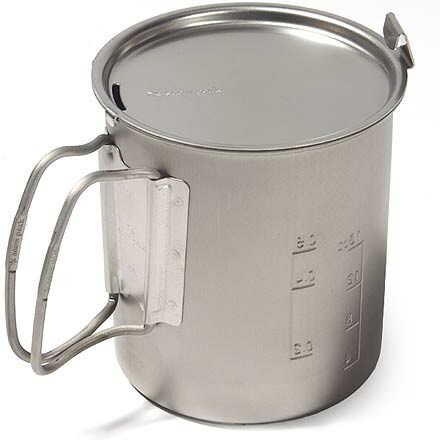 Weight: 13 oz.. Capacity: 900 Pot holds 30oz and the Lid has a 5 in. diameter x 1.75 in.. 1400 Pot holds 47oz. and the Lid has a 5.75 in. diameter x 1.5 in. The Snowpeak Trek Combo Titanium Cook Set is a lightweight, 4-piece cook set that will allow even minimalist backpackers to whip up gourmet meals in the backcountry. Corrosion-resistant titanium is super lightweight and has superior strength compared to steel. 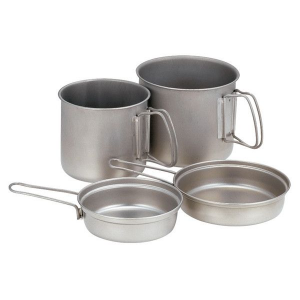 This set includes two pots (47 oz and 30 oz) and two lids that double as fry pans (5 3/4 "x 1 1/2 " and 5" x 1 1/2 "). The smaller set fits neatly inside the larger set, reducing the stowed size to 5 3/4" x 6". The entire set weights a mere 13 oz. Each piece has a folding handle that tucks neatly away. The Snow Peak Giga Power Stove [SNO0002] and fuel canister stow nicely inside the cookware for easy transport and storage.